In this month’s Underreported Struggles: Ngobe Leaders reach an accord with Panama, securing their land from mining and exploration; 4,000 indigenous people block entries to the oil-producing department of Arauca, Colombia; the Innu Council of Pessamit discovers a mining company illegally drilling on their territory. A BC Judge dismissed the Sinixt Nation’s application for a judicial review, giving Sunshine Logging clearance to begin logging within the Perry Ridge wilderness preserve. According to the Sinixt lawyer David Aaron, the application was dismissed because the Sinixt “are not a group capable of sufficiently precise definition with respect to their group membership.” The Canadian government still considers them to be legally non-existent. Ngobe-Bugle Leaders agreed to call off their massive blockade on the Pan American Highway after reaching a late-night accord with the Panamanian government. In exchange for re-opening the Highway, Panama’s delegation promised not to prosecute anyone that participated in the nationwide protests; to release everyone that was arrested during the clashes on Feb. 25; and to create a new law prohibiting mining and exploration activities within the Ngobe-Bugle’s territory. Additional talks will take place on March 1st. A Brazilian judge suspended work on the massive Belo Monte hydroelectric dam in the state of Para, citing more than two dozen unmet environmental and social conditions. “The suspension… is a reprieve for the people and the environment of the Xingu River Basin,” said Leila Salazar-Lopez, program director with Amazon Watch, in a recent press release. Federal judge Ronaldo Desterro also urged the national development bank, BNDES, not to fund the project. Indigenous Communities in Peru agreed to send thousands of seeds to the Svalbard Global Seed Vault, a secure seedbank located on the remote Arctic Svalbard archipelago in Norway. The vault, often described as the “Noah’s Ark for seeds”, was built as a refuge for seeds in the case of large scale crises, such as climate change. More than 10,000 seed samples are currently stored at the vault. A Judge in Ecuador found that Chevron must now pay $8.6 billion to help restore the Amazon. On February 14, Ecuador’s Superior Court Judge Nicolas Zambrano ruled that Chevron is legally liable for the 18.5 billion gallons of oil that now sits in the Amazon raiforest, a toxic legacy that some refer to as the “Amazon Chernobyl.” Unfortunately, the company wasted no time announcing that they will do everything in their power to have the ruling thrown out. Diplomatic cables released by Wikileaks revealed a US Ambassador’s “obsession” with Venezuela, radicalism and fears of an Indigenous rule in Peru. As reported by Censored News, the cables show repeated attempts by former US Ambassador Curtis Struble to discredit Indigenous people rights an interests in favour of industry. Other cables show another Ambassador, James Nealon, making identical claims. A community in the Ilaje Local Government Area of Ondo State, in southwestern Nigeria, threatened to shut down all of Chevron’s nearby oil operations unless the US company adressed their demands by the end of February. The people of Obe-Nla say that Chevron has given them nothing but environmental degradation, marginalisation, exclusion and the outright denial of benefits that other communities receive. The Evenk people in northern Russia spoke out against a new gas pipeline that threatens to degrade their hunting and fishing grounds. “We are not against progress or economic development, but we feel like we are the ones who will suffer from this,” states an Evenk petition, which was signed by 213 people. “Our reindeer pastures and hunting sites are being seized, rivers are being poisoned and fish are disappearing.” The Evenk are asking for the pipeline to be re-routed somewhere else. Indigenous Peoples in Mexico and the United States came together for an “unforgettable meeting of cultures” this month in South Texas. After learning about a Canadian mining company’s plan to mine silver on the Wixarika’s traditional territory in Mexico, the Native American Church invited the Wixarika to attend the International Convention, which was joined by Lakota, Navajo, Chippewa, Cree, Coahuiltecan, Chichimecan and others from around the Hemispshere. Participants at the Convention ultimately voted unanimously to join the Wirikuta Defense Front. Various media reports this month suggest that more and more Indigenous Peoples are choosing a “green future”. For instance, the Jemez Pueblo in New Mexico are moving ahead with the first utility-scale solar plant on tribal lands, a project that could bring millions of dollars to the poverty-stricken Nation. Elsewhere, the Tsleil-Waututh Nation in British Colombia agreed to develop a locally-owned wind farm; and in Saskatchewan, the Muskoday First Nation is continuing to develop their own, independent, organic food co-op. Green projects like these offer a sustainable way for Indigenous Nations to get out of the economic crisis imposed by Nation States. The London-based mining company Global Coal Management Resources (GCM) managed to re-open negotiations with the government of Bangladesh over their proposed Phulbari open-pit coal mine, a project that would negatively impact, according to some estimates, up to 470,000 people. GCM fled from the Phulbari region in 2006, after the Bangladesh government promised to ban open-pit coal mining and expel the mining company, then known as Asia Energy Corporation. The Kashia Pomo in Sonoma County, California, won a major victory in defence of their Indigenous Rights, thanks to the California Fish and Game Commission (CFCG). The CFCG voted on Feb. 3 that the Pomo should be allowed to permanently fish, gather food and conduct ceremonies in the marine protected area at Stewarts Point. According to archaeological evidence, the Pomo have used Stewarts Point and the surrounding shoreline for the past 12,000 years. The Innu Council of Pessamit filed a complaint with the Quebec Ministry of Natural Resources after discovering that a mining company, Nevado Resources Corporation, was carrying out illegal drilling activities on the Pessamit Innu’s territory. 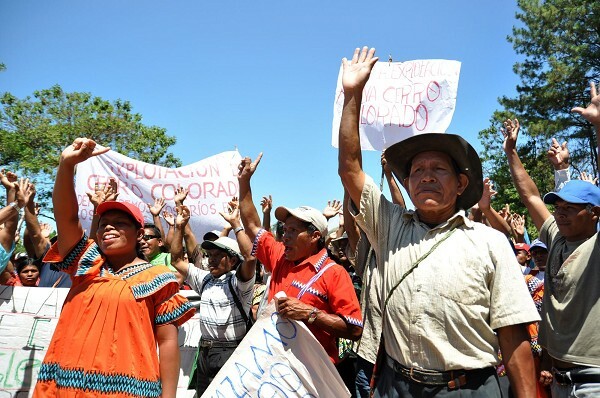 “We have never given Nevado permission to drill on our territory. We demand that it cease all activities immediately”, stated Raphaël Picard, current chief of the Innu Council. The Alberta court of appeal issued a ruling against the Athabasca Chipewyan First Nation (ACFN), dismissing the indigenous community’s right to “meaningful consultation.” ACFN had asked the court to cancel several government leases to Shell Canada because they weren’t informed of them beforehnd. The court, however, determined that they were adequately informed, because notices of the sales had been posted on some websites. Eagle Rock (Migisi Wa Sin) – Timeless Media Productions and Michigan State Environmental Journalism Students present “Eagle Rock”, a mini-documentary about a sacred site as old and as valuable as Stonehenge; and the Sulfide Mining controversy that surrounds it. Doug George-Kanentiio on the Origin of Indigenous Peoples – Doug George-Kanentiio, speaking at the event “Return Our Ancestors” American Indians and NAGPRA – Voices from the Haudenosaunee. Recorded at Binghamton University on May 6, 2010. Niyamgiri You Are Still Alive An award-winning documentary about the struggle to protect Niyamgiri from the UK mining company, Vedanta.